KEAAU, Hawaii — The Maui High School football team has never won a state tournament game, but the Sabers went down fighting in their latest appearance. Defending Division I state champion Hilo beat the Sabers 35-24 in a state semifinal Friday night at the Keaau High School field. The Maui Interscholastic League D-I champions saw their season end at 5-6 with their fourth loss in state and third in five seasons. “Very much like our MIL championship, I’m proud of the boys,” Maui High coach James Kammerer said. “They could have easily packed it in, but defensively we got that fumble recovery for a touchdown and then some turnovers, so I’m very proud of our defensive effort. Hilo pulled away from a four-point lead with two back-breaking touchdown drives to end the first half and to begin the second half to push the lead to 28-10 with 8 minutes, 12 seconds to go in the third quarter. Both drives were kept alive when the Sabers were drawn offsides on a hard count by Vikings quarterback Kyan Miyasato. The opening drive of the second half went 65 yards in 10 plays and was capped by a 1-yard scoring pass from Miyasato to Kyler Aguiar, who caught four passes on the drive for 47 yards. The Sabers climbed back into the game on two huge plays by Mone Tongi. First, he returned a fumble 57 yards with 5:19 left in the third quarter. Then, after a fumbled punt, he ran in from 17 yards to make it 28-24 with 3:12 left in the quarter. After the Vikings went 38 yards in four plays, Kalae Akui was stripped of the ball on a 13-yard reception and Maui High’s Viliami Makoni recovered at the Sabers’ 18-yard line late in the third quarter. The Sabers went three-and-out and the Vikings went 65 yards and took a 35-24 lead with 8:13 to play when Aguiar snuck in from 1 yard out on fourth-and-goal. That drive was kept alive when Maui High was called for roughing the kicker on a successful 33-yard field goal by Joshua Rosario. “Definitely not the outcome we wanted or expected, but we had a great season, we all stuck together at the end, and we tried our best to do what we could to get to where we wanted to go,” said Sabers senior Trent Takara. The Vikings jumped on top early after they were able to take advantage of a Sabers’ turnover. Naia Nakamoto fumbled on Maui High’s third play from scrimmage and Hilo recovered at the Sabers’ 39-yard line. Hilo took a 7-0 lead on a 3-yard pass from Miyasato to Kalae Akui less than 3 minutes into the game. The Sabers helped the four-play drive with a 15-yard penalty when they hit a sliding Miyasato after a 3-yard gain on first down. Miyasato then hit Legend Figueroa on an 18-yard strike on the play before the touchdown. The Sabers took advantage of a takeaway to climb within four points. 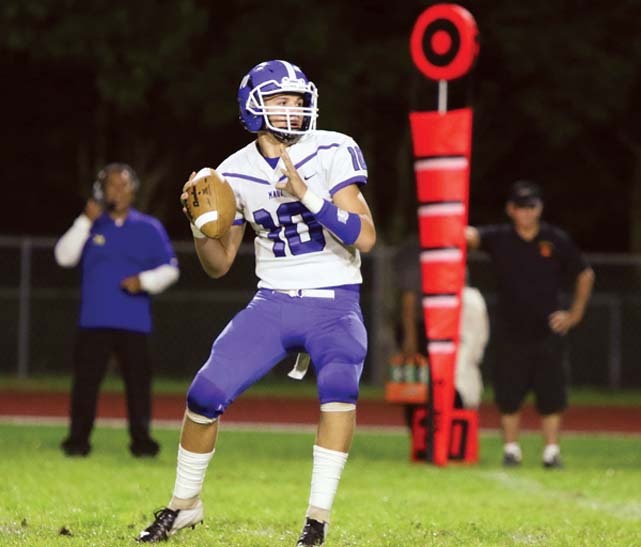 Senior linebacker Cameron Russell intercepted a shovel pass to set the Sabers up on the Hilo 15, but they could not gain a first down and settled for a 32-yard field goal by Brex Delray. Mitchell Hirose nearly pulled in a spectacular touchdown pass on the play before the field goal, but the ball glanced off his fingertips in the end zone. 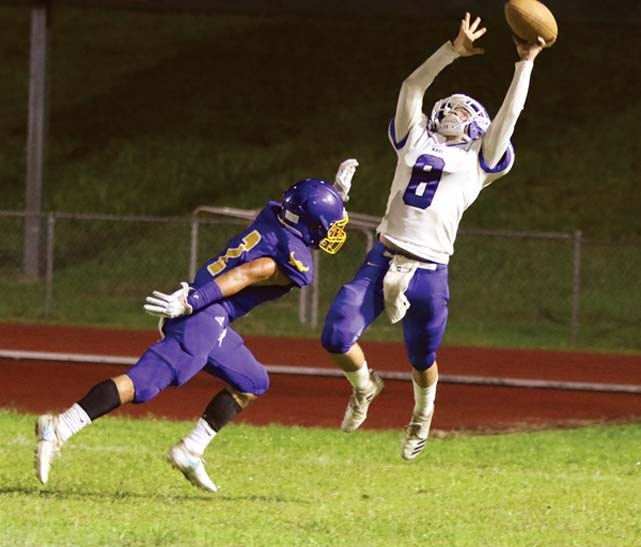 The teams traded three-and-out possessions before the Sabers went on a 10-play, 60-yard drive that ended on downs at the Hilo 15 after Taelen Bates nearly hauled in a touchdown pass on a trick play on second down. The Vikings pushed their lead to 14-3 on an 11-play, 85-yard drive that was capped by a 2-yard scoring dive by Guyson Ogata. Kaleo Ramos ran the ball five times for 45 yards on the possession. Nakamoto broke free just four plays later when he took a swing pass, broke a couple tackles and rumbled 70 yards to score to bring the Sabers within 14-10 with 6:13 to go in the first half. The Vikings answered on their next possession when Ogata caught a 45-yard pass from Miyasato on second-and-31 with 23 seconds left in the half. The play came after the Sabers pushed the Vikings back on a 13-yard holding penalty. With just over 2 minutes left in the first half, the Sabers’ defense was flagged for encroachment on fourth-and-5, giving the Vikings a first down on the Sabers’ 23. The Sabers gave the Vikings first downs three times on encroachment penalties — all of the infractions led to touchdowns. Maui High’s defense had six takeaways, four fumble recoveries and two interceptions. 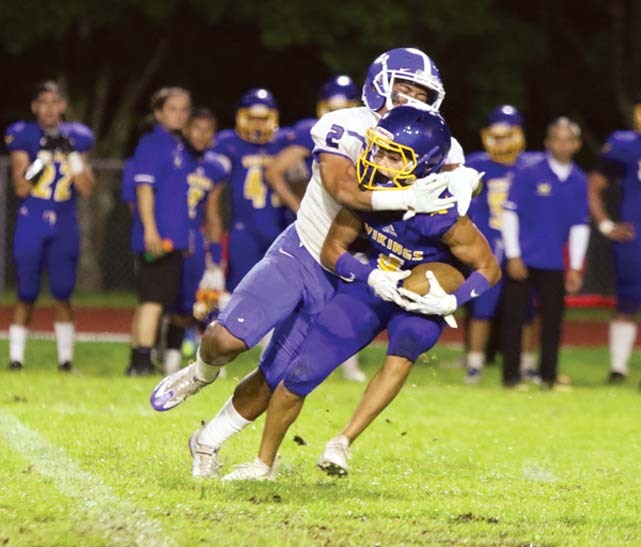 “Stressful game, I think we had six turnovers, we gave up one 70-yard touchdown, we gave up one scoop and score for about 60,” Hilo coach Kaeo Drummondo said. “Too much of a nail-biter. You cannot play big games and turn the ball over six times. It’s frustrating, but you’ve got to take the W’s any way you can get them. H–Kalae Akui 1 pass from Kyan Miyasato (Joshua Rosario kick), 9:04. MH–FG Brex Delray 32, 4:58. H–Guyson Ogata 2 run (Rosario kick), 7:31. MH–Naia Nakamoto 70 pass from Delray (Delray kick), 6:13. H–Ogata 45 pass from Miyasato (Rosario kick), 0:23. H–Kyler Aguiar 1 pass from Miyasato (Rosario kick), 8:12. MH–Mone Tongi 57 fumble return (Delray kick), 5:19. MH–Tongi 17 run (Delray kick), 3:12. H–Aguiar 1 run (Rosario kick), 8:13. RUSHING–Maui High, Mone Tongi 4-34, Naia Nakamoto 12-24, Mitchell Hirose 3-5, Torryn Kauhaahaa-Sulusi 1-3, Taelen Bates 1-(-5), Brex Delray 3-(-14). Hilo, Kaleo Ramos 25-139, Kyler Aguiar 5-14, Lyle Silva 3-12, Guyson Ogata 4-9, Team 2-4, Elijah Apao 1-2, Kyan Miyasato 3-(-2). PASSING–Maui High, Brex Delray 4-16-1-117, Taelen Bates 1-5-1-15, Torryn Kauhaahaa-Sulusi 1-2-0-4. Hilo, Kyan Miyasato 19-31-2-227, Kaimi Tiogangco 0-1-0-0. RECEIVING–Maui High, Naia Nakamoto 2-91, Torryn Kauhaahaa-Sulusi 2-25, Trent Takara 1-16, Christian Lee 1-4. Hilo, Guyson Ogata 3-79, Kyler Aguiar 7-61, Kalae Akui 7-47, Legend Figueroa 2-40.